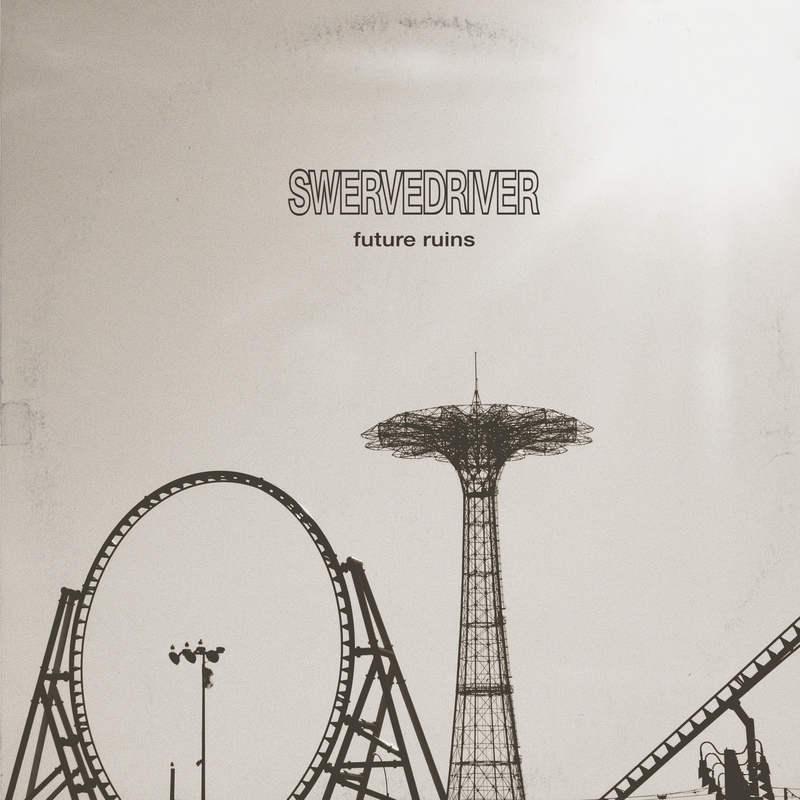 Only four years after the record that brought them out of a seventeen-year hibernation comes Future Ruins, Swervedriver’s latest successful post-reunion attempt at rejuvenating their trademark sound. Not all heroes wear capes – some just like to stare intently at their pedal boards for prolonged periods of time. Initially having been active between 1989 and 1998, Oxonian quartet Swervedriver are to be considered elder statesmen of the British shoegaze scene, although there’s a point to be made about them kind of being the odd ones out because of their significant crossover into the adjacent musical territories of grunge and (later) psychedelic rock. Their pioneering role doesn’t end there, either; their 2008 reunion put them years ahead of the curve when it comes to older shoegaze bands like Slowdive returning to the fold in the wake of the renewed interest in this style of music brought on by their 21st century epigones. After the previous seventeen-year gap between their last two records, which ended in 2015 with the release of I Wasn’t Born To Lose You, Swervedriver now strike while the iron is still reasonably hot. As suggested by its cover artwork adorned by the washed-out silhouettes of Coney Island amusement park rides, Future Ruins harbors a blissful yet ominous melancholia within its ten tracks. It keeps the band’s core sound largely intact, albeit not without betraying traces of a certain mellowness of age. In most any situation in life, it’s expedient to put your best foot forward from the very beginning; after all, first impressions can make and break even a piece of recorded music! The band themselves seem to be acutely aware of this fact, as “Marywinter” and “The Lonely Crowd Fades In The Air” are a great opening couplet, carefully selected to represent a good portion of what’s to come in the following ~38 minutes without giving away the more surprising tricks up the band’s collective sleeve. The contrast set up between the two tracks is also remarkable. Where the former takes a more subtle approach by pairing endearingly jangly guitars with Adam Franklin’s smooth vocal delivery, the latter forcibly burns itself into your short term memory thanks to its supremely catchy hook. So far, so satisfyingly foreseeable. Where the real moment of genuine intrigue outside of the comforting familiarity of Swervedriver’s warm, spacious brand of shoegaze lies is in the clever use of guitar effects and borderline psychedelic elements. The unobtrusive background blips and twangs in title track “Future Ruins” are a good example of this, as are the retrofuturistic, almost phaser-like sounds in “Theeascending”. These little explorations and interpolations strewn across the record are what leavens the overall aesthetic and structure of Future Ruins, doing so in a wonderfully unassuming and placid way as to not draw the listener’s precious attention too far away from the record’s actual meat and bones. One last song I absolutely have to mention in this review is “Golden Remedy”, simply because I am quite infatuated with its stumbling beat and chirpy electronic touches. Despite remaining committed to the largely deliberate pace introduced and maintained by its seven predecessors, the song comes across as being somewhat more upbeat and less woozy in comparison, which I am willing to attribute not only to the aforementioned electronics, but also to the fun jam session vibe its ending section gives off. It’s just not as hopelessly (read: comfortably) lost in the rather dazed – or should I say ‘gazed’? – melancholy Future Ruins predominately deals in. At this point, it’s fair to say that Future Ruins solidifies what I Wasn’t Born To Lose You hinted at, namely that Swervedriver made the right decision in ending their seventeen-year hibernation when they did. Nothing you hear on this record even remotely paints the much-dreaded picture of a tired band trying to cash in on the nostalgia wave created by a myriad of younger, more driven groups. Instead, these songs document the ongoing and confident rejuvenation of a band thoroughly enjoying their second wind. I sincerely hope that they can keep this positive trend going in the future.